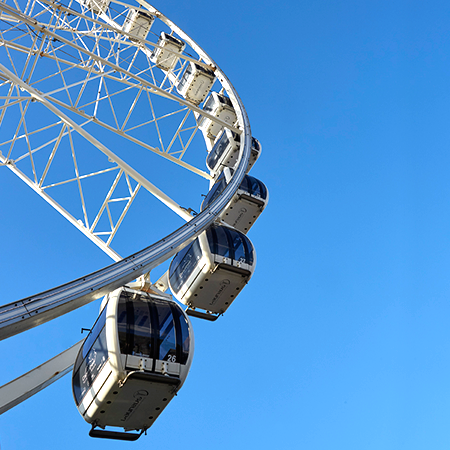 Our Cape Wheel is a giant observation wheel that offers a spectacular 360 panoramic view of Cape Town from the vibrant V&A Waterfront precinct. Your viewing experience across the Mother City includes Table Mountain, Robben Island, Cape Town City skyline, Paarl Mountains, and the Cape Town Stadium. The Cape Wheel offers 30 fully enclosed air conditioned cabins that will take you 40 metres above the ground in safety and comfort on the four revolution ride. Two of the cabins are wheelchair friendly.